I’m outside a lot. Sometimes I take my camera, sometimes I don’t. Sometimes I am just hiking with my dog, or tending the garden. But some days, I will get my camera battery fully charged up, my car full of gas, snacks, binoculars, layers of clothing and a change of shoes and socks on the ready, and I will head out for the day. Do I always come home with a camera full of photos? No way. But sometimes I am in the right place at the right time. The only way I get to be in that lovely spot is by going out in the first place. Last weekend I started the day out with a hike to Gull Island, at Presqu’ile Park. On my way through the woods I scared up a Great Horned Owl! No photos as we were both very surprised. What a beautiful bird. And huge.. After my crossing to Gull Island I found the first Snowy I have seen this fall. He was very very sleepy from his journey south. 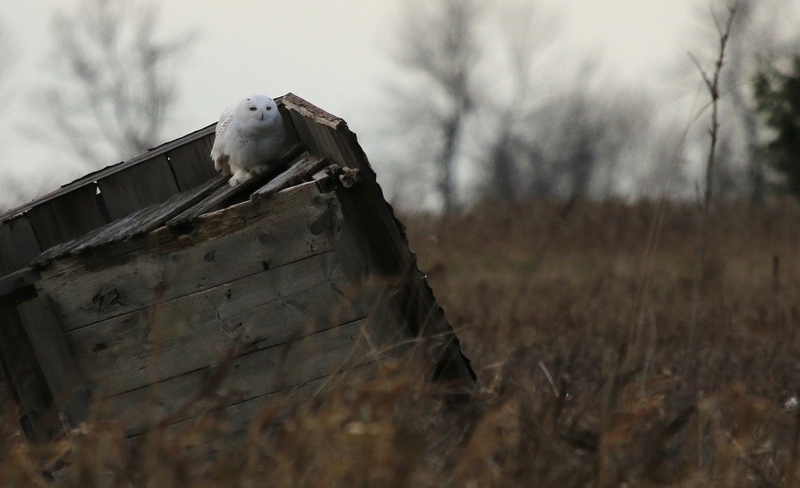 Who knows if this will be another big year for Snowy Owls in our part of Ontario. Time will tell. Now that the leaves are off the trees it is a lot easier to see the resident Barred Owls at the park, which I did as I was driving to get coffee and rum cake at the annual Christmas at Presqu’ile event. So many people whipped past me on the road and passed this owl by. 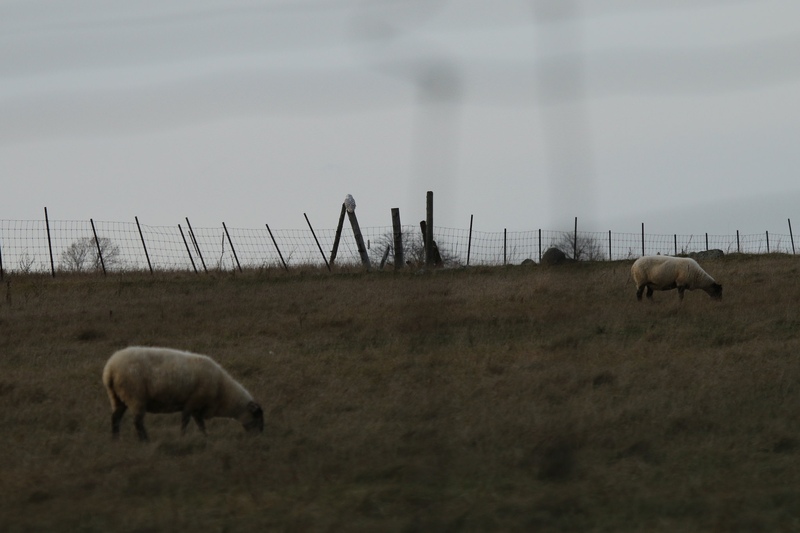 The trick to noticing wildlife is to drive annoyingly slowly. My next stop was Amherst Island- how could I resist. I thought the owling might be good over there because as soon as I stepped out of the car I noticed little voles skittering all over the place- rustling through the grass, little dark grey shapes running across my path. Well sure enough, I saw a few more snowies, some closer, some far away. 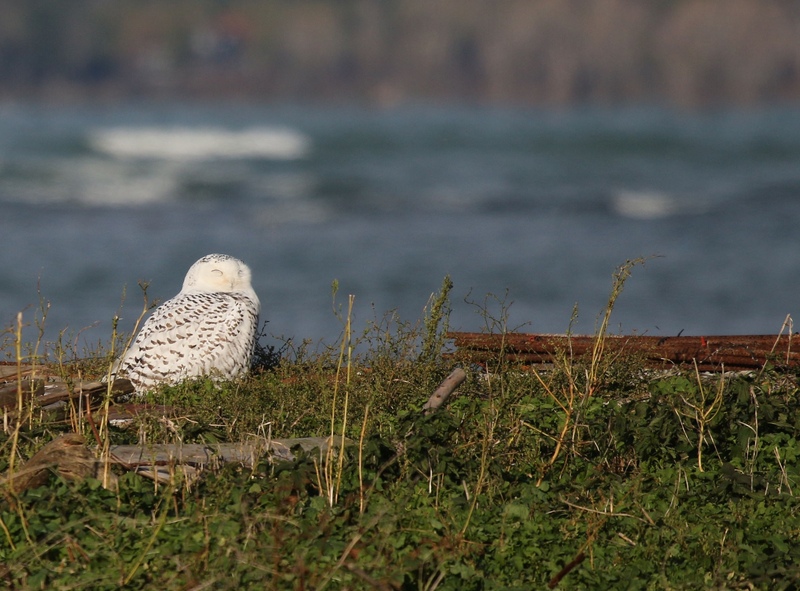 Typical Snowy Owl scene. Far away. In sheep field. On fence post. 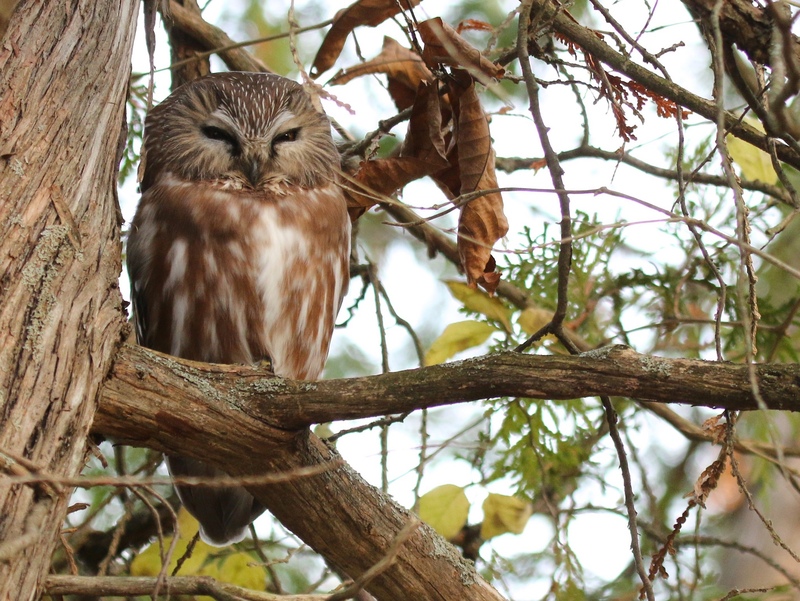 Next a very nice woman showed me where a little Saw Whet Owl was sleeping. This absolutely made my day. These little cuties are as big as your hand. Incredibly well camouflaged. Oh my goodness. 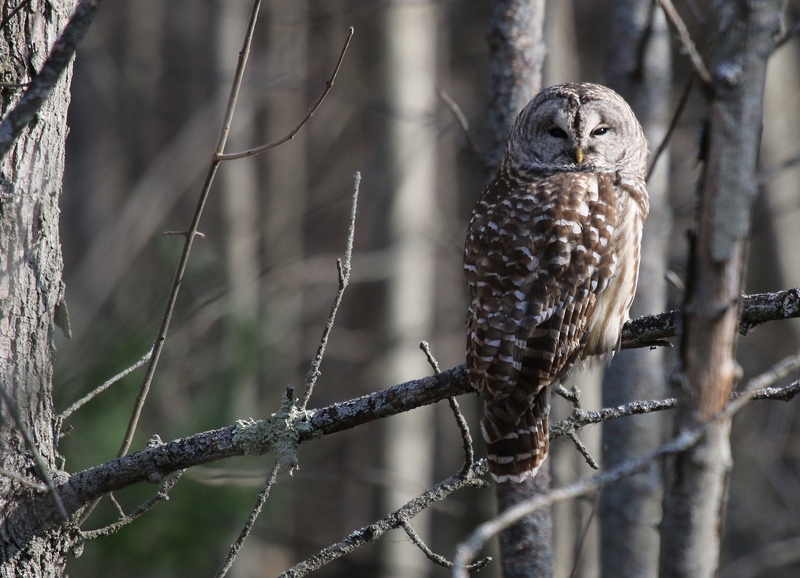 I ended my day there by spotting a Barred Owl hunting by the side of a dirt road. The second of the day. 9th owl, of 4 species. Right place, right time? This time, you bet. 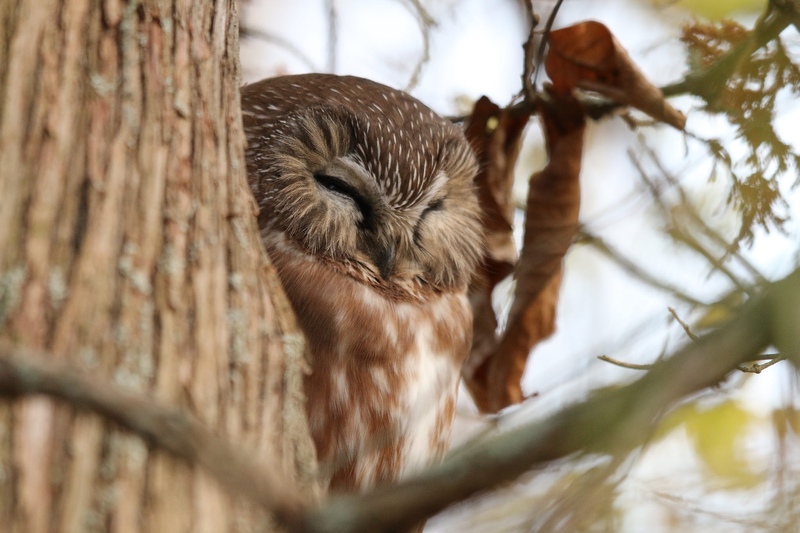 amherst island, barred owl, birds, camouflage, Canada, lake ontario, nature photography, ontario, owl, presqu'ile park, Presqu'ile Provincial Park, raptor, saw whet owl, snowy owl, wildlife photography, winter. Bookmark. I know what you mean some days are better than others, especially when owling! Your photo’s are always such a joy to see. Thanks so much. Thanks Amy. I figure if I don’t go out, I won’t see anything so I just enjoy the day whatever happens. But sometimes- bonus! So cool Leslie! You must have felt “full” after this day! I would!! Amazing photos! Yes. 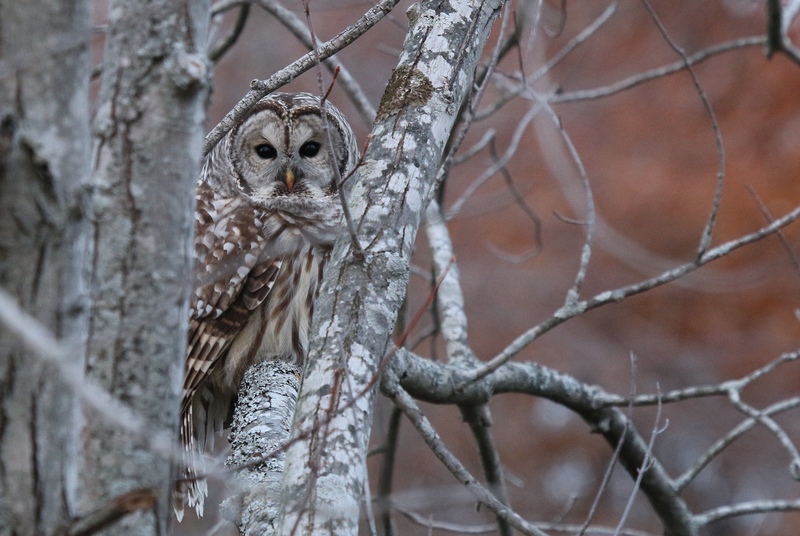 For some reason the most exciting one was the Barred Owl I saw right at sunset. So unexpected. I love seeing all your owls. Thanks Leslie for getting outside and finding these lovelies. Do you have to book a spot to go to Amherst island? Hi Patti the ferry leaves Millhaven ever hour at the :30. It is $9.oo Cash only. Have fun!